With lower commodity prices and the cost of inputs and land expected to remain steady for 2015, farmers are looking at different ways to save money without sacrificing yield. One practice that’s gained momentum with conventional and no-till farmers alike is strip-tillage; or as, we at Environmental Tillage Systems like to call it, zone till. Why do we call it that? Well, aside from the fact that it’s fun to tell people “Don’t bother me. I’m in the Zone”, the work taking place in the field is happening in two zones: the growth zone and the work zone. But before we get in “the zone”, let’s make sure we’re on the same tillage page. If you’re new to the term strip-till, it’s a conservation tillage method that combines the best elements of no-till (planting right into last year’s crop residue) and conventional tillage (tilling the soil until the field is black and residue is minimal). 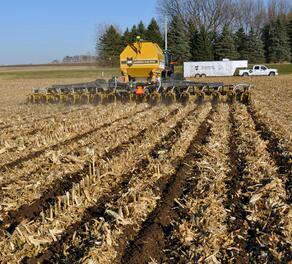 Strip-till involves using coulters, cogs, or a shank to churn about one third of the soil in the field. This creates black strips through the remaining 2/3 of the field that is left untouched and packed with residue from previous crops. The SoilWarrior creates two complimentary zones: a growth zone and a work zone. The growth zone is formed by the SoilWarrior’s patented rolling cog as it breaks through compaction, cultivates the soil, and blends in fertilizer. The end result is an ideal seedbed with nutrients in the right place and right time for plant growth. The work zone is the area that’s left undisturbed. Many may look at this as fallow but agronomists will tell you there’s a lot going on. The decomposing plant residue enriches the soil with organic matter and the roots holds the dirt in place so it doesn’t wash away. Zone till has shown to hold its own when compared to conventional tillage. Through difficult weather conditions and corn-on-corn rotations, SoilWarrior customers have not experienced a drag in yield when they transition from conventional to zone tillage. The biggest yield advantage appears to be for those switching from no-till to zone till. On average, university research suggests about a 6-10 bushel gain. Why consider changing your tillage practice? First, think about the investment you’re making in the land. According to University of Minnesota Extension Soil Specialist, Jodi DeJong-Hughes, tillage practices lead to more erosion than wind and rain combined. In 2013 Ag Web reported USDA data showing the average cost of an acre of farmland in the U.S. was $2,900, but states along the corn belt experienced a per acre average as high as $6,400. Doesn’t it make sense to keep as much of that valuable soil in the field as possible? Then, add up the cost savings that it provides. The SoilWarrior precisly places nutrients in the zone (reducing fertilizer costs) and results in making less passes across the field (reducing fuel costs and time spent in the tractor). And finally, the biggest payback you will see over time is healthier soils. Farming is a career that most people do not choose; it chooses them. It’s a path that farmers are called to follow, just like their parents and grandparents before them. It demands a strong work ethic, entrepreneurial spirit, and genuine love of the land. And it’s that desire to preserve the land for future generations that drives farmers to see past the obstacles and adopt new practices to protect and defend the land. Watch this video featuring Jodi DeJong Hughes, University of Minnesota Extension Soil Specialist, to learn more about strip till and its benefits.